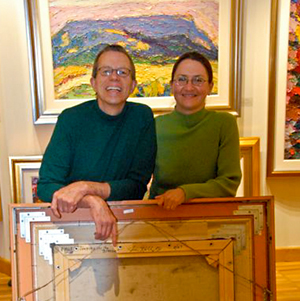 Laura and Jim met in the fall of 1989 at a Santa Fe art gallery opening. They locked eyes and smiles and instantly became great friends. A short time after getting to know Jim, Laura realized that working with him would be a powerful vehicle for her spiritual, artistic and personal growth. Laura brought extensive experience in custom picture framing and a great eye for art. As a gallery director and an artist’s assistant wearing many hats, and the challenges that come with each one, Laura thrives. She is fully committed to facilitating bringing Rabby’s paintings to fruition and assisting collectors in acquiring his artwork.